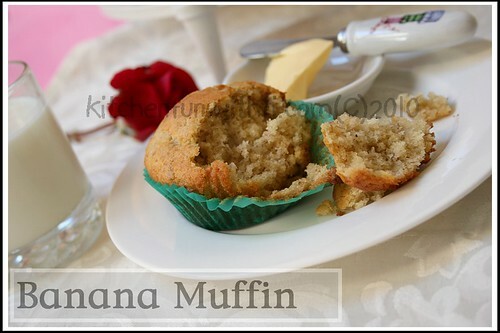 There are many recipe for banana muffin, and most of all using brown sugar (just like my banana bread), but this recipe called for caster sugar instead, i love the texture of this muffin, so moist and i can really taste the mashed banana. I don't have mixed spices, so i tried to experiment making them, by mixing a pinch of ground nutmeg, cinnamon, and allspice, the taste was absolutely great!. Even if you only have nutmeg and cinnamon it's just as good. 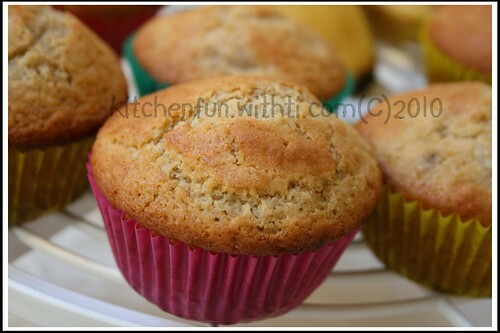 I got this recipe from my favorite baking book called : The Essential Baking Cookbook"
2. Mixed sugar, flour, mixed spice, stir trough. 3. Make well in the centre. 4. In a jug, mix together the milk, eggs and venilla essence. 5. Pour liquid into the well in the flour and add the mashed banana then cooled butter. mix well. 6. Bake for 20-25 minutes, or until golden brown. Note: Easy for beginner :) no mixer required. So don't be afraid to try .